This dress code policy will pertain to all classes. Dance classes are an interpreted style of movement/exercise where appropriate dance apparel needs to be worn. 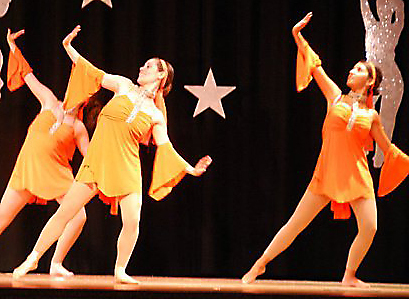 Dancers need to attend classes in dance clothing that allows the dancer to perform their dance moves with ease. As well as clothing, appropriate dance shoes are also part of the dancer’s apparel. Contact your specific teacher if you have questions regarding any dance clothing or shoes. (ballet “slippers” from Wal-Mart/Target, etc. are not acceptable). - A leotard or dance dress (any color), with pink, white, black or tan tights. - A leotard with “dance/workout yoga” pants or dance shorts. Tap/Jazz (Wednesday Class) - Black oxford tap shoe and black slip on jazz boot. Tap/Jazz (Friday Class) - Black, split sole, oxford tap shoe and black slip on jazz boot. All dancers in the following classes should wear a leotard with “dance/workout yoga” pants or fitted dance shorts. A leotard with knit ballet shorts or fitted dance shorts with pink, black or tan footless tights. A leotard for acrobatics is mandatory as students can not be concentrating on tumbling safely if they need to worry about keeping their shirt down. Leotards can be worn with fitted dance shorts or fitted dance pants. Loose fitting clothing cannot be worn in class. Dance Dimensions t-shirts/tank tops/sweatshirts may be worn over leotards as cover-ups but must be removed at the start of class. If a student comes to class dressed inappropriately, they may be asked to sit out for that class. Dancers will not be permitted to dance in street clothes, jeans, brownie uniforms, sports uniforms, etc. You would not send your child to sports in their dance clothing – please do not send them to dance in anything other than what is listed above. For your convenience we carry all of these items at the studio. All students are required to have a “dance” bag to keep their shoes in. “Dance” shoes are not to be worn outside. Any student with shoulder length hair or longer must wear their hair up in a ponytail. Water is the only beverage permitted in the dance rooms at any time.